Home > Shop By Brand > Menzerna Polishing Compounds > Menzerna Heavy Cut Compound 1000 128 oz. Menzerna Heavy Cut Compound 1000 128 oz. Remove 1000-1500 grit sanding scratches with virtually no loss of surface gloss! 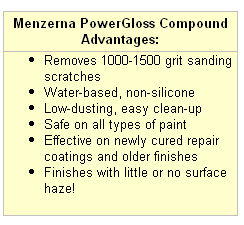 Note: Menzerna Heavy Cut Compound 1000 is the new version of Menzerna Power Gloss Compound (PG-1000). Menzerna has changed the name and label, but it is the same product you know and love. It is currently only available to select U.S. retailers. Menzerna Heavy Cut Compound 1000 is a powerful polishing compound approved for scratch removal on newly cured paint and older paints. 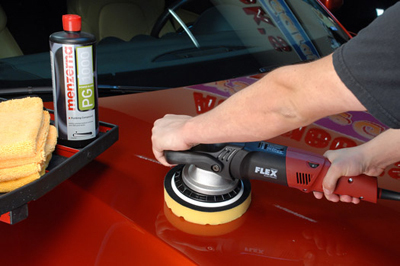 This silicone-free, low-dusting compound removes sanding scratches, overspray, and swirls like an aggressive compound but PowerGloss finishes like a car polish! Menzerna Heavy Cut Compound 1000 finishes like a polish! That’s right, a compound – the heavy hitter in terms of cut – finishes with the gloss and smoothness of a polish. Menzerna is able to do this because of the uniform, specially milled aluminum oxide abrasives that break down under the gradual increase in heat produced by the polisher. This is what we call a self-refining compound. Most light colored vehicles will not require subsequent steps to restore gloss. The speed and efficiency of Menzerna makes it particularly attractive to professional detailers and auto refinishers who require results they can count on time and time again. In fact,Menzerna Heavy Cut Compound 1000 is not a true compound. Its unique formulation makes it a heavy cutting polish. The distinction is how smoothly Power Gloss finishes compared to typical compounds. A traditional compound has chunky abrasives designed to cut the paint. Power Gloss’ nano abrasives polish the paint. Thanks to the quality, size, and number of nano abrasives, Power Gloss is able to give you defect removal like that of a compound, without the heavy compounding swirls. Menzerna Heavy Cut Compound 1000 is excellent for restoring aged and weather-beaten paint finishes. It eliminates scratches on any type of paint, including today’s scratch-resistant paints, such as the ceramic clear coat used by Mercedes. Menzerna Power Gloss levels defects quickly when used with a heavy cutting foam or wool pad on a dual action or rotary polisher. A high concentration of abrasives combined with their uniform size and shape enable Power Gloss Compound to level paint defects using consistent abrasive action. The abrasives are not bigger or harder than in a polish. There’s simply more abrasives to repeatedly go over the blemish, gradually leveling the paint and then refining it as the abrasives shrink. Because the abrasives in Menzerna Heavy Cut Compound 1000 gradually level the paint, this is a very clean compound. There is minimal dusting and easy clean-up. Menzerna Heavy Cut Compound 1000 is a professional polish. It is designed to achieve the best results with a circular polisher. You can use a dual action polisher, like the Porter Cable 7424XP, but it will require a longer working time. Enjoy a faster, more effective compound with the ability to cut without causing haze. Menzerna Heavy Cut Compound 1000 eliminates 1000-1500 grit sanding scratches, overspray, and swirls on all types of paint like a compound but finishes like a polish. Make sure the surface to be compounded is clean and dry. Fresh paint should be fully cured. Apply PowerGloss out of direct sunlight. Use a wool or foam compounding pad, such as Lake Country’s CCS Yellow Cutting Pad or The Edge Yellow Cutting Pad. Apply a 6 inch line of compound to the vehicle. With the polisher turned off, spread the compound over about a 2 x 2 sq. ft. area. Polish at 1200-1800 RPM (5000-6000 OPM with a dual action polisher) working slowly across and then up and down the area. Check your work after several passes to see if the defect has been removed. If so, reduce the pressure and continue buffing until a high gloss is achieved. If the pad becomes dry, mist it with water and continue buffing. Wipe the area with a damp microfiber cloth. If necessary, follow with Menzerna Final Polish to restore optimum gloss. Always apply a wax or sealant after compounding or polishing. We recommend Wolfgang Deep Gloss Paint Sealant 3.0 to seal in the shine with its long-lasting polymer formula. Click here to view Menzerna Comparison Chart. To seal in the shine after using Menzerna polishing compounds, try Wolfgang Deep Gloss Paint Sealant 3.0. Wolfgang's water-based, non-cleaning formula is compatible with all Menzerna polishes. Right now, SAVE $5 on Wolfgang Deep Gloss Paint Sealant 3.0 when you purchase it with a Menzerna product! Menzerna Heavy Cut Compound 1000 32 oz. About Menzerna Polishing Compounds of GermanyJescar Finishing ProductsMenzerna Polishing Cream Metal Polish German Deep Gloss ComboGerman Final Gloss ComboMenzerna Ceramic Intro KitMenzerna Fast Gloss ComboMenzerna One-Step Polish 3-in-1 8 oz.Menzerna One-Step Polish 3-in-1 32 oz. Menzerna Super Heavy Cut Compound 300 8 oz.Menzerna Heavy Cut Compound 400 8 oz.Menzerna Medium Cut Polish 2400 32 oz.Menzerna Medium Cut Polish 2400 128 oz.Menzerna Super Finish (SF-3500) 8 oz.Menzerna Super Finish (SF-3500) 32 oz. Menzerna Super Finish (SF 3500) 128 oz. Menzerna Super Finish Plus (SF-3800) Menzerna Control CleanerMenzerna Super Heavy Cut Compound 300 32 oz.Menzerna Heavy Cut Compound 400 32 oz.Menzerna Heavy Cut Compound 1000 32 oz. It's exactly what they claim it to be. Quick working,minimal dusting & removes defects with ease!! Ill never use any other's again!